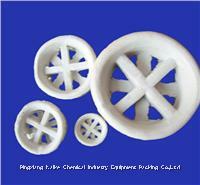 Ceramic CascadeRing is a kind of random packing further developed on the basis of Pall Ring and Raschig Ring. The ratio of ring height to its diameter is ½ and a conical rolled edge is added to the ring’s end. The ring’s height is decreased and tube wall is thinned. Due to the additional conical rolled edge, the mechanical strength of the ring is improved and the ring’s symmetry is destroyed. Therefore, accumulation voidage is increased significantly. The resistance to vapor is decreased and flux is increased a lot when vapor-liquid flows through the packing bed. Distribution of vapor-liquid is distributed more evenly and the interface between vapor and liquid is increased so as to improve the mass transfer efficiency. With the characters of high mechanical strength, high chemical stability, and excellent heat endurance, CascadeRing can resist high temperature, acid (except HF), alkali, salt and various organic solvents. It's widely applied in various packing towers of desiccation, absorption, cooling, washing, and regeneration in industries of petrochemical, chemical, metallurgy, gas and oxygen generation.